Heat oven to 450ºF. Line a baking sheet with foil and set a baking rack on top. 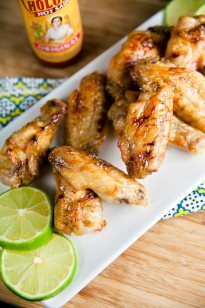 Sprinkle the chicken wings with a little salt and arrange skin-side up on the baking rack. Bake for 30 minutes, or until the skin is crisp and the chicken is cooked through. Meanwhile, in a small saucepan bring the tequila, honey, and juices to a simmer. Let simmer 10 minutes. Brush about half of the glaze onto the wings; cook another 10 minutes, or until the wings are golden brown. Remove from the oven and brush with remaining glaze. Sprinkle with coarse sea salt. Serve with Tabasco hot sauce, if desired.